Our campaign costs ($600) can be attributed as pure labor. There were no fees associated with any of the sites to which we submitted. This cost is based on $60 per hour (for submissions and periodic re-submissions). That number could be reduced by at least 50%. We’ll explain how in the next section. These new subscribers are among the most qualified we can win. They joined because they were searching for our content, not because they were incentivized through a sweepstakes or “give-away”. We can reasonably expect a higher than average retention rate. How would we use these finding, in our next campaign to reduce our costs from $5 to $.25 per subscriber? We would begin with a different set of expectations. We would view this process as a necessary and LONG-TERM investment, and we would carefully track our results by implementing a new system for measuring, individually, each site’s performance. We would reduce our expenses. That is (a) we would reduce the required AMOUNT of labor by refining the number of submissions. (b) We would also reduce the average COST of labor by asking first-tier talent to draft the listing, and second-tier talent to submit the listing. We would write the listing in third person (editorial) language as opposed to first person (advertising) language. 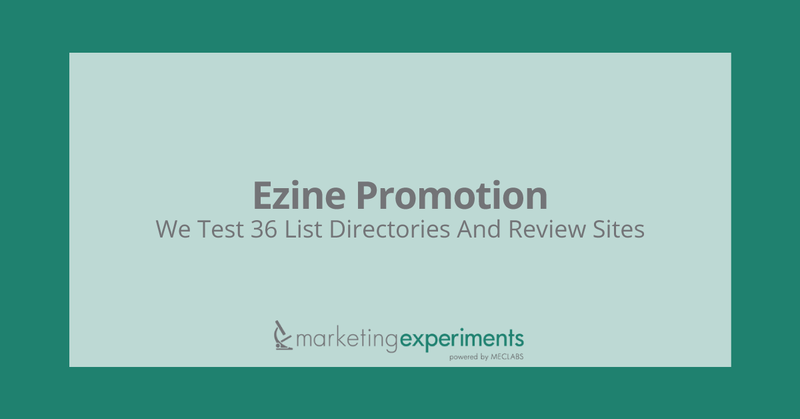 With regards to the announcement lists, we would submit only to New-List.com, and we would submit often, targeting anyone of their 21 categories which might find our test ezine appealing (Although they may discourage this approach). With regards to review sites, we would submit to two of the sites we previously used, and then one new (very promising) site. This new review site offers three different editions. Dr. Mark Brownlow, a frequent contributor has earned degrees at Reading, Aberdeen, and Oxford. His work is rich, professional and full of insight. For the first two review sites, we would include a pre-written review. For the third we would not. We would check and re-submit any failed listings after 14 days, and then again 30 days later. So how would this strategy impact our results? If we were to use the same test ezine, and if conditions were to remain relatively constant, we might expect to win approximately 1100 new subscribers over a period of 12 months. By narrowing our focus, and reducing the costs of labor, it is conceivable to achieve this number for less than $275.00. This would yield an average of less than $.25 per subscriber …and it should be noted that the campaign could continue to produce results even after the arbitrarily defined 12-month period. This could further lower our true cost per subscriber. So how else can you build an ezine’s subscriber’s base? We are currently researching co-registration projects, viral syndication, and web-based ezine marketing. We hope to provide more help in future reports.